Georgia vital records are available at various prices, though the date range for records in Atlanta is limited. 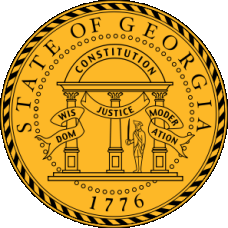 Georgia marriage records cost $10 for licenses issued since June 1952, and certified copies are an option until 1996. For earlier records, consult the Probate Judge in the relevant county. No licenses obtained after July 1997 are stored centrally. For Georgia divorce records, the fee is $2 plus 50c per page, with files available in Atlanta from June 1952 and otherwise held by that county's Clerk of Superior Court; certified records are not open to the public. Georgia was a long-time member of the Solid South, voting for no Republican presidential candidate until 1964, when Barry Goldwater became the first Republican to carry the state since Ulysses S. Grant in 1872. After that, Georgia was fairly reliably Republican, voting only for Jimmy Carter twice and Bill Clinton once. Note: This agency will do search to identify the county of record and issue a certificate, but cannot issue a copy of the original record. Otherwise records must be obtained from the county of record. Record Access Requirements: Certified copies of marriage licenses are available to the general public; but copies of the marriage application are only issued to bride and groom. Records may not be ordered via e-mail. Note: This agency will do search an index to identify the county of record and issue a confirmation, but cannot issue a copy of the original record. Certified copies are only available at the county level. Note: GCIC is the central criminal records repository for the State. Record requests must be made electronically via an electronic fingerprinting device or via the Georgia Applicant Processing Service (GAPS). The office will not answer the phone after 2PM. Record Access Requirements: Records are available at GCIC to employers, government agencies that include licensing agencies and adoption and foster care providers. 100% of arrest records are fingerprint supported. Search Note: Certain law enforcement agencies, who are online, and local agencies may access and retrieve records for investigative/background purposes. These agencies have the option of requesting a signed release or waiver from the subject. Note: Email questions to info@dcor.state.ga.us. Search Note: Location, physical identifiers, conviction information, release dates, and inmate number are released.